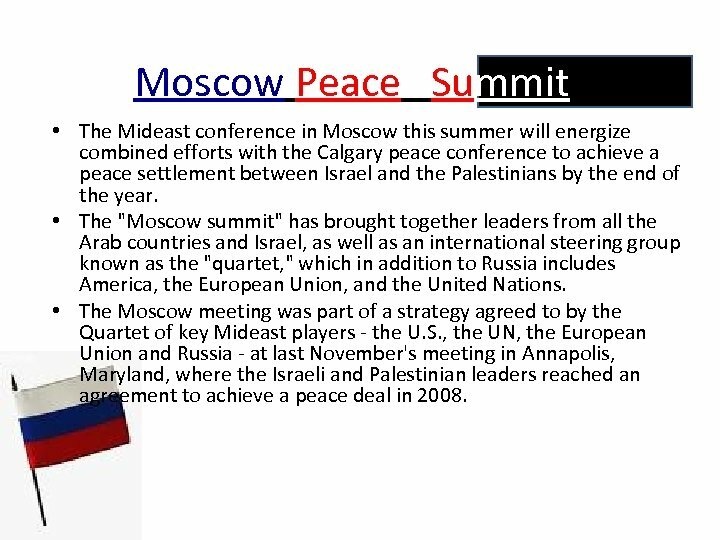 Moscow Peace Summit • The Mideast conference in Moscow this summer will energize combined efforts with the Calgary peace conference to achieve a peace settlement between Israel and the Palestinians by the end of the year. • The "Moscow summit" has brought together leaders from all the Arab countries and Israel, as well as an international steering group known as the "quartet, " which in addition to Russia includes America, the European Union, and the United Nations. 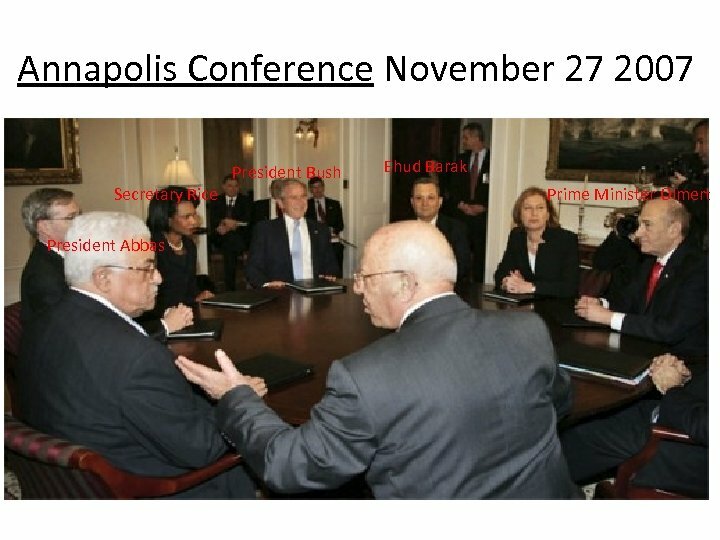 • The Moscow meeting was part of a strategy agreed to by the Quartet of key Mideast players - the U. S. , the UN, the European Union and Russia - at last November's meeting in Annapolis, Maryland, where the Israeli and Palestinian leaders reached an agreement to achieve a peace deal in 2008. 1. 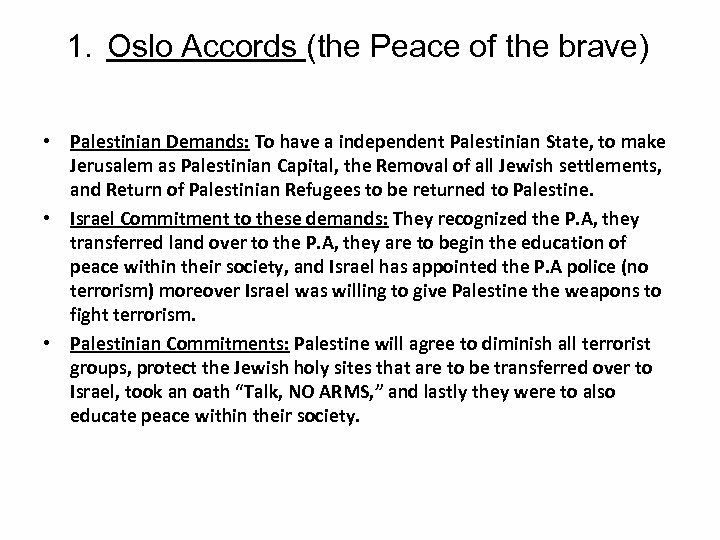 Oslo Accords (the Peace of the brave) • Palestinian Demands: To have a independent Palestinian State, to make Jerusalem as Palestinian Capital, the Removal of all Jewish settlements, and Return of Palestinian Refugees to be returned to Palestine. • Israel Commitment to these demands: They recognized the P. A, they transferred land over to the P. A, they are to begin the education of peace within their society, and Israel has appointed the P. A police (no terrorism) moreover Israel was willing to give Palestine the weapons to fight terrorism. 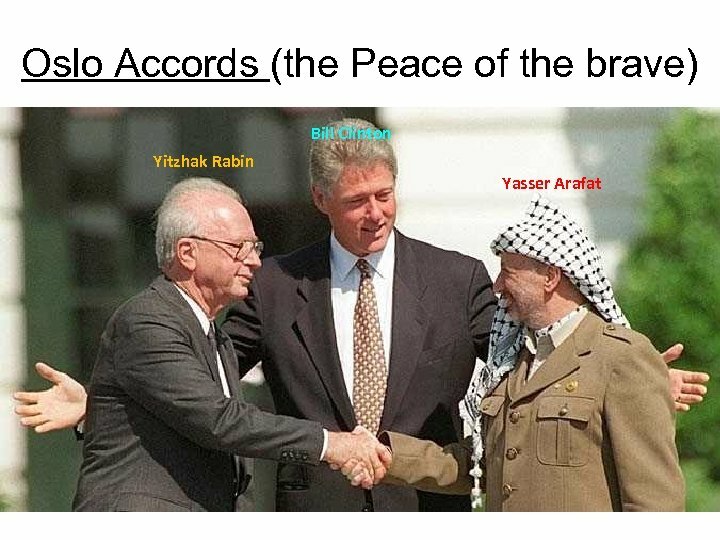 • Palestinian Commitments: Palestine will agree to diminish all terrorist groups, protect the Jewish holy sites that are to be transferred over to Israel, took an oath “Talk, NO ARMS, ” and lastly they were to also educate peace within their society. 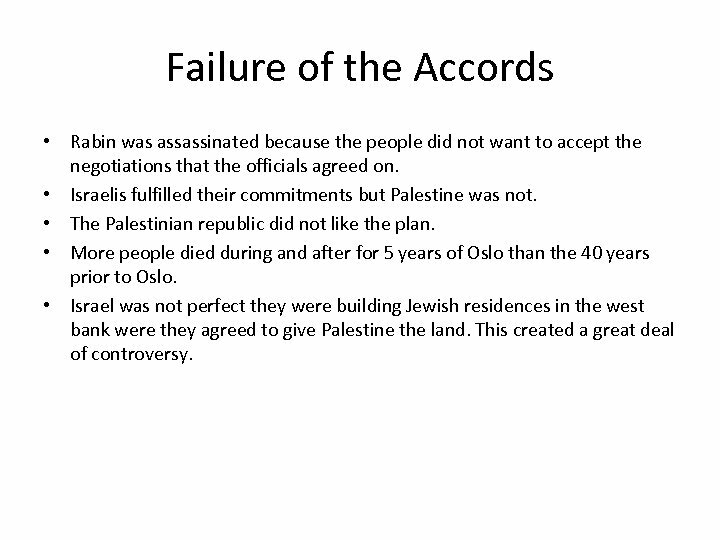 Failure of the Accords • Rabin was assassinated because the people did not want to accept the negotiations that the officials agreed on. • Israelis fulfilled their commitments but Palestine was not. 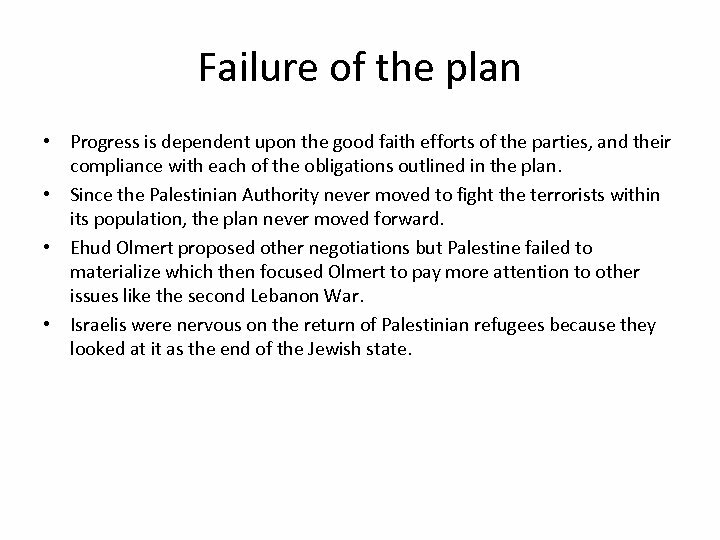 • The Palestinian republic did not like the plan. 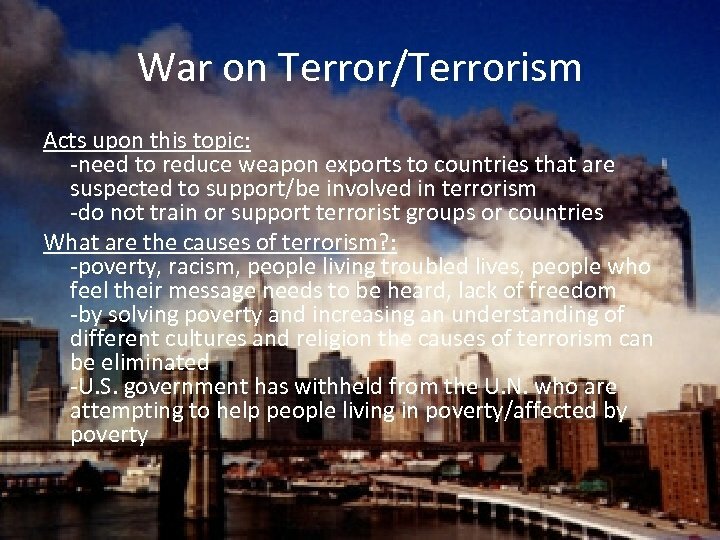 • More people died during and after for 5 years of Oslo than the 40 years prior to Oslo. • Israel was not perfect they were building Jewish residences in the west bank were they agreed to give Palestine the land. This created a great deal of controversy. 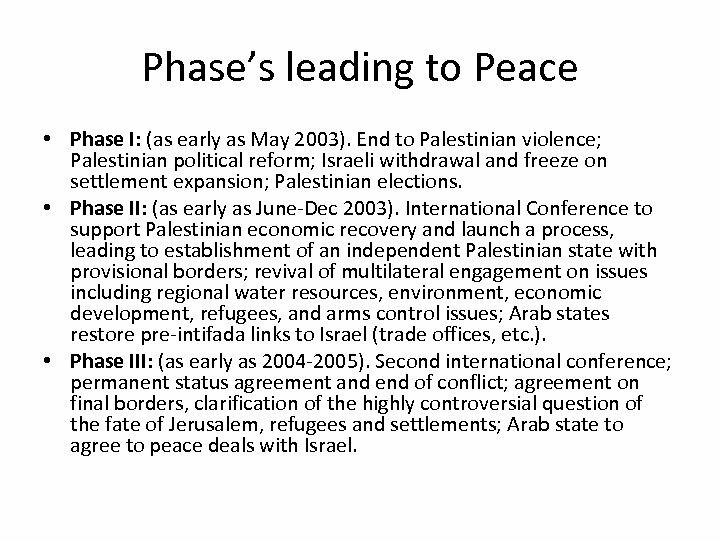 Phase’s leading to Peace • Phase I: (as early as May 2003). End to Palestinian violence; Palestinian political reform; Israeli withdrawal and freeze on settlement expansion; Palestinian elections. • Phase II: (as early as June-Dec 2003). International Conference to support Palestinian economic recovery and launch a process, leading to establishment of an independent Palestinian state with provisional borders; revival of multilateral engagement on issues including regional water resources, environment, economic development, refugees, and arms control issues; Arab states restore pre-intifada links to Israel (trade offices, etc. ). • Phase III: (as early as 2004 -2005). 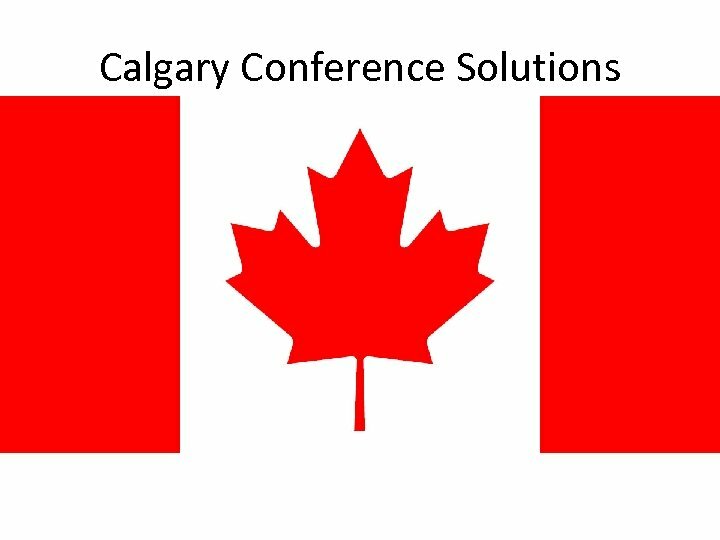 Second international conference; permanent status agreement and end of conflict; agreement on final borders, clarification of the highly controversial question of the fate of Jerusalem, refugees and settlements; Arab state to agree to peace deals with Israel. Failure of the plan • Progress is dependent upon the good faith efforts of the parties, and their compliance with each of the obligations outlined in the plan. • Since the Palestinian Authority never moved to fight the terrorists within its population, the plan never moved forward. 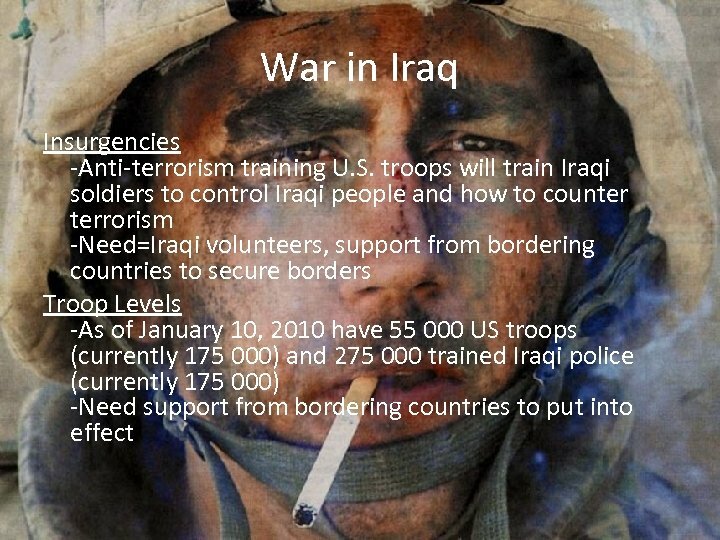 • Ehud Olmert proposed other negotiations but Palestine failed to materialize which then focused Olmert to pay more attention to other issues like the second Lebanon War. • Israelis were nervous on the return of Palestinian refugees because they looked at it as the end of the Jewish state. 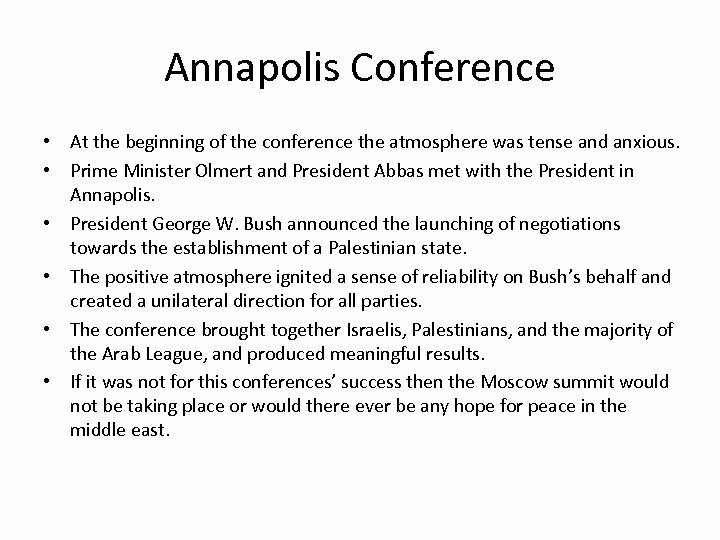 Annapolis Conference • At the beginning of the conference the atmosphere was tense and anxious. • Prime Minister Olmert and President Abbas met with the President in Annapolis. 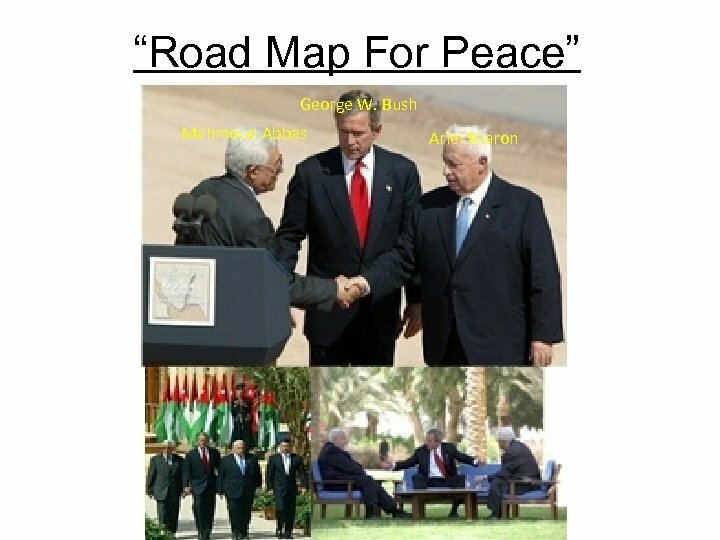 • President George W. Bush announced the launching of negotiations towards the establishment of a Palestinian state. • The positive atmosphere ignited a sense of reliability on Bush’s behalf and created a unilateral direction for all parties. • The conference brought together Israelis, Palestinians, and the majority of the Arab League, and produced meaningful results. 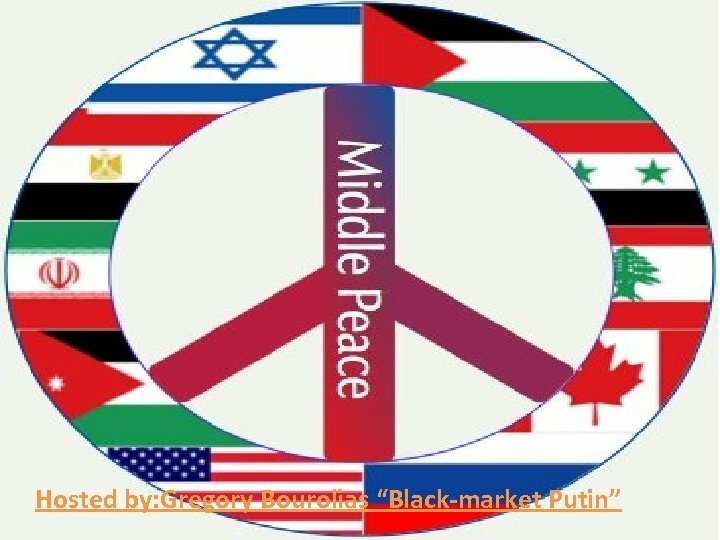 • If it was not for this conferences’ success then the Moscow summit would not be taking place or would there ever be any hope for peace in the middle east. 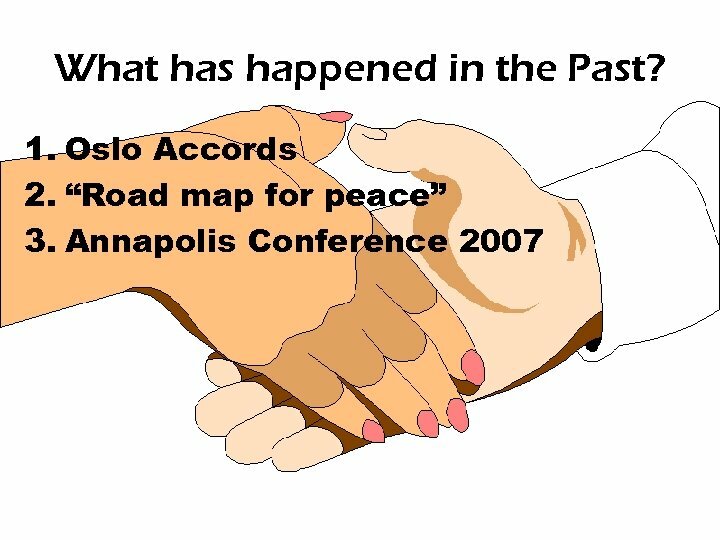 Attributes of a PEACE path • End to violence. 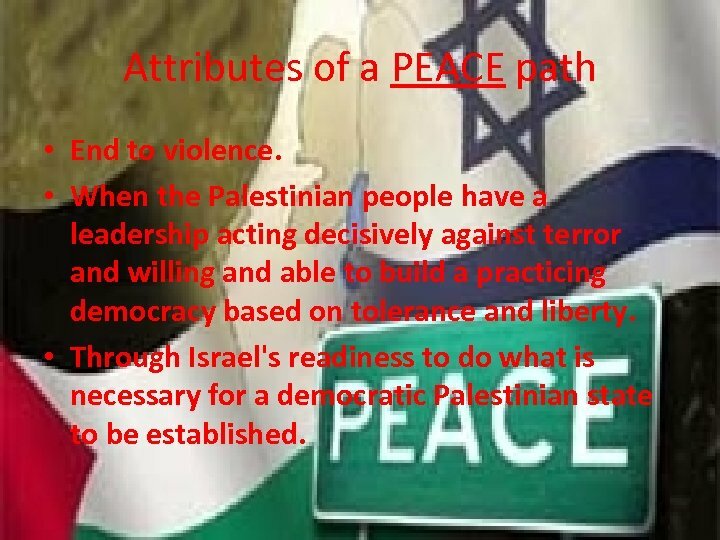 • When the Palestinian people have a leadership acting decisively against terror and willing and able to build a practicing democracy based on tolerance and liberty. • Through Israel's readiness to do what is necessary for a democratic Palestinian state to be established. 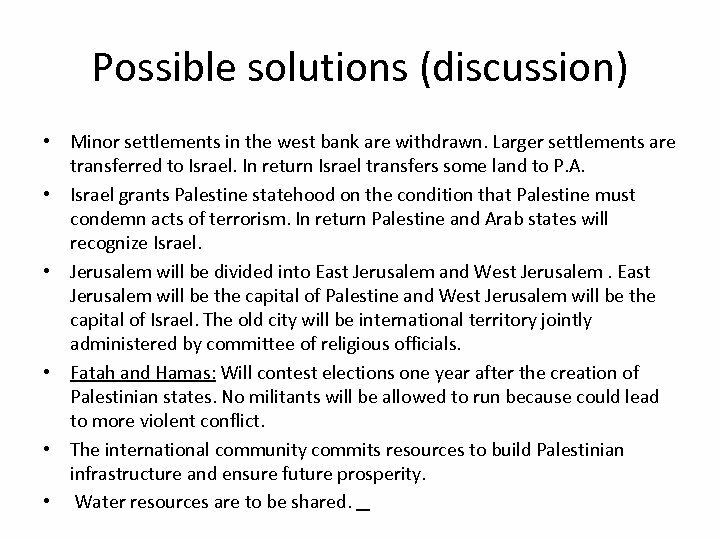 Possible solutions (discussion) • Minor settlements in the west bank are withdrawn. Larger settlements are transferred to Israel. In return Israel transfers some land to P. A. • Israel grants Palestine statehood on the condition that Palestine must condemn acts of terrorism. In return Palestine and Arab states will recognize Israel. • Jerusalem will be divided into East Jerusalem and West Jerusalem. East Jerusalem will be the capital of Palestine and West Jerusalem will be the capital of Israel. The old city will be international territory jointly administered by committee of religious officials. • Fatah and Hamas: Will contest elections one year after the creation of Palestinian states. 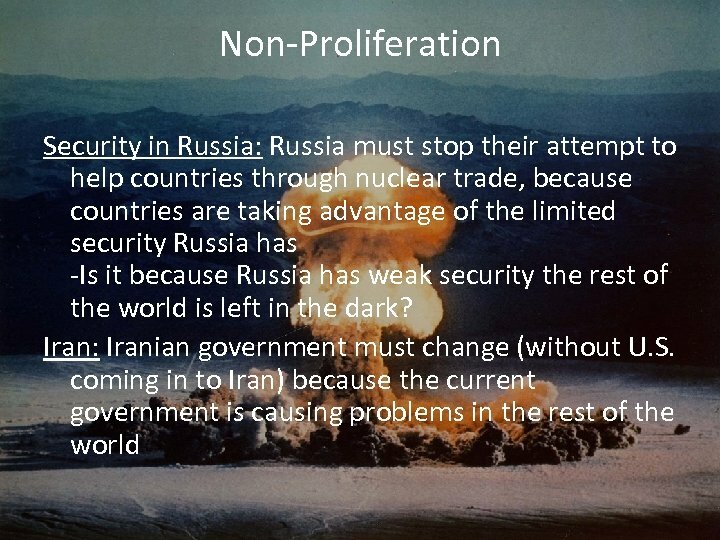 No militants will be allowed to run because could lead to more violent conflict. • The international community commits resources to build Palestinian infrastructure and ensure future prosperity. • Water resources are to be shared.